According to the legend, when Buddha reached enlightenment he invited all the animals to celebrate their joy. Only 12 animals, the Rooster and 11 others, accepted the invitation, and for that they were included, from that moment onwards, in the Chinese zodiac. How do I know if I’m a Rooster? As we have indicated before, each animal ‘governs’ a specific year. 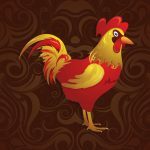 The years of the Rooster in the Chinese Horoscope are: 1909, 1921 1933, 1945, 1957, 1969, 1981, 1993, 2005, 2017… and thus consecutively adding 12 years to the previous figure. Roosters are exuberant; they know it and they love showing it to others. At the same time they are extroverted and friendly. In general, they are good communicators, enthusiastic and fun. It is difficult to see a Rooster standing still or silent. Although it might seem that Roosters are very sure of themselves, in fact they are not: they need the constant approval of others to feel good. Sensitive: those who were born in the year of the Rooster are extremely sensitive and it is very easy to harm them if you know how to do it. Protectors: they like to take care of those who are close and, although they enjoy their independence, they have a feeling of belonging to their family and friends deeply rooted. Educated: Rooster natives give great importance to conversation and, therefore, they strive to read and learn new things that can be used later in an event. They are usually intelligent people who do not mind being foolish from time to time if the situation requires it. Extroverts: In general, the Rooster has the kind of personality that we all want to have close to us in a party: talker, witty and with many interesting stories to tell. When those born under the influence of the Rooster have the element water, they are capable of working as a team, understanding and affectionate. They’re concerned about social problems and tend to be more calm and tender. The ones under the influence of the element wood tend to be more creative and, above all, more intense, with all the good and bad that comes with it. Under the fire element, the Rooster develops an almost unique capacity to plan the future, acting as if they knew all the setbacks fate has for them. In the Chinese Horoscope, the Rooster under the influence of the earth is very determined, responsible, ambitious and brutally honest. The Chinese Horoscope defines them as people who are somewhat inflexible in their way of thinking, which sometimes can be a problem.